Powered by Tyus Battle, Oshae Brissett, and Frank Howard, Syracuse fought back from as many as 13 points down to pull out an 86-79 overtime win at Georgetown. Those three, who are the top scorers for the Orange (9-1) on the season, combined to score 55 of 62 points after halftime and lead a rally from 13 points down to defeat against the Hoyas (8-1). Battle, who went the first 16 minutes after halftime without a field goal, drained a pair of triples in the final four minutes to help erase an eight-point Georgetown lead in that time. The senior guard opened the extra session with another three and SU never trailed after that, making 9-of-12 foul shots in the final two minutes to pull away for the win. After being outworked on the glass in the first half, Syracuse dominated the boards after the break, posting a 26-16 advantage, including 15 offensive rebounds on 23 missed field goals. That advantage helped offset a poor shooting day from the field by the Orange, who made only 40.6 percent of their shots in the game. That bad shooting mark was worse than what the Hoyas managed in the game, but the hosts could not shoot straight from beyond the arc. Georgetown made only 2-of-17 three-pointers in the game, including missing all six that they tried in overtime. The first half was a grind for both teams on offense, as it took almost four-and-a-half minutes for the Hoyas to score, but SU only managed a 3-0 lead prior to Georgetown breaking through. Georgetown was able to post the first meaningful run, ripping off a 10-2 streak that lasted over four minutes to take a 17-12 lead with under six minutes left in the half. Syracuse responded with a run of their own to knot the score. Tyus Battle swished a three-pointer from the right wing to break the dry streak, then, after a Hoya basket, Frank Howard found Matthew Moyer cutting baseline with a bounce pass for a dunk. Howard then sliced in from the right wing on the next trip for a lay-in that tied the game at 19 a side with 4:15 on the clock. Georgetown had the better of play to the half, taking a 28-24 lead at the break. The Hoyas continued piling on after intermission, scoring eight of the first ten points of the second half to grab the first double-digit lead of the day at 36-26 less than three minutes into the second half. 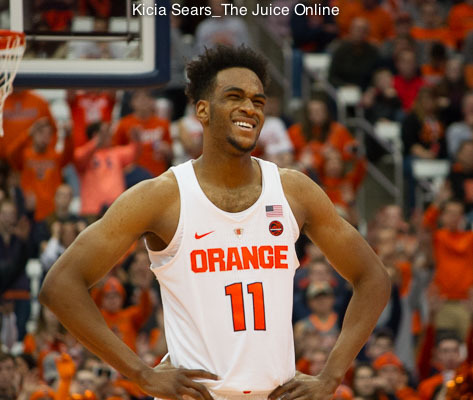 Oshae Brissett would later draw the Orange within seven on a three-pointer, but the hosts responded to make it a 12-point lead. Brissett later chipped the gap back down to seven points again with a triple and a pair of free throws, but the Hoyas tacked on six straight markers for a 53-40 lead with just under 11 minutes left in the second half. SU immediately bit into the lead when Howard got an off-balance lay-up, then set up Brissett for a three from the right side to make it an eight-point game. The two then got the margin down to seven a couple minutes later when Howard drove for a lay-in and Brissett made a foul shot on the next trip. The lead remained between seven and ten points for the next three minutes until Battle coaxed a three to fall with four minutes to play that brought Syracuse within 65-60. Two possessions later, Georgetown stretched the lead back to seven, but Howard dropped a push shot in from the paint to pull back within five. The Hoyas responded with another deuce for a 69-62 advantage with under three minutes to play. The Orange responded by erasing the lead in under 90 seconds. Howard started the run with a bounce pass to a cutting Moyer for a two-handed slam from the baseline. Under a minute later, Brissett dealt to Battle, who swished a trey from the left corner with a Hoya defender closing out. Howard then came up with a steal and went the length of the court for a lay-up to tie the game at 69 with a minute to play. After a Georgetown miss, SU came down with the ball. Battle missed a foul line pull-up, but Moyer grabbed the board and passed to Howard, who could not connect on a straightaway three. Brissett cleared that miss, but his putback try was snuffed out and the Hoyas rebounded before time elapsed. 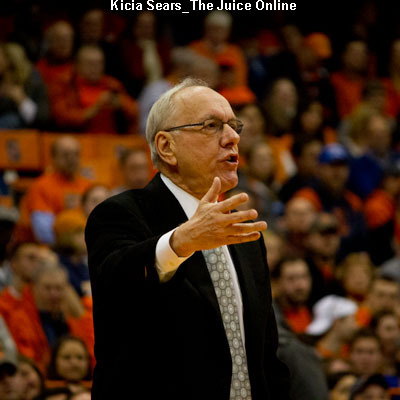 An official called a foul on Syracuse, but it was wiped away after the other two officials ruled the whistle came after time ran out. Five minutes went on the scoreboard and Syracuse controlled the tip. Battle’s three from the right wing swirled around the rim and dropped on the opening possession. After the Hoyas got a basket, Howard tossed an alley-oop to Paschal Chukwu to put the Orange back on top by three. The Hoyas responded with another bucket, but Battle buried a three from the deep right wing to stretch the SU lead to four midway through the session. Georgetown got a set of foul shots, but Brissett matched them. After a missed Hoya three, Battle missed one for the Orange, but Marek Dolezaj grabbed the loose rebound and was fouled. Dolezaj converted that into two points at the line, pushing the Syracuse lead to 81-75 with 1:09 remaining. Another Georgetown miss turned into another trip to the free throw line for the Orange. This time, Brissett made only the first shot to make it a seven-point lead. The Hoyas got a score and fouled. Battle made both to make the margin seven once more, which proved to be more than enough with only 25 seconds remaining. Tyus Battle scored a career-high 29 points in the contest, including a personal best six three-pointers, four of them coming in the final nine minutes of action. Oshae Brissett had the best game of his brief career at SU, piling up personal bests of 25 points and 14 rebounds, eight of them coming on the offensive end. Brissett scored 24 points after halftime, hitting four three-pointers in the second half. Frank Howard filled up the stat sheet with 19 points, nine assists, and three steals. Four different Georgetown players reached double digits, led by Jessie Govan’s 21 points. Jagan Mosely backed Govan with 20 points off the bench. Marcus Derrickson and Jamorko Pickett added 14 and 12 points, respectively. 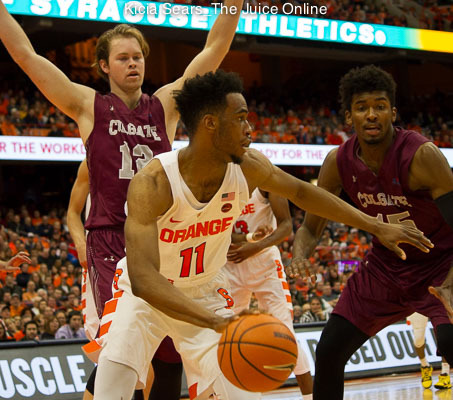 Syracuse returns to the Carrier Dome for their next contest, as they will face intrastate foe Buffalo on Tuesday. The Bulls stand 7-3 and will bring a three-game winning streak with them when they travel east on the New York State Thruway. Buffalo cruised past Robert Morris on Saturday, 86-70, as five different players scored in double figures. C.J. Massinburg is the biggest threat for the Bulls, as the 6’3” guard averages 20.0 points and 7.8 rebounds per game. Massinburg has also hit 31 three-pointers on the season at nearly a 47 percent clip. Four other Bulls average double figures in scoring on the season, including Nick Perkins at 14.2 points per game, but one-fourth of that quartet, guard Dontay Carruthers, has missed the last three games with a foot injury. Tuesday’s tip between the Orange and the Bulls is set for 7:00pm Eastern and can be seen online at ESPN3.com.